Few things are as frustrating as your air conditioner blowing hot air on an even hotter day. All you want is to relax inside your house away from the heat, but your AC isn’t cooperating. With how hot it gets here in Phoenix, that’s not a comfortable feeling. 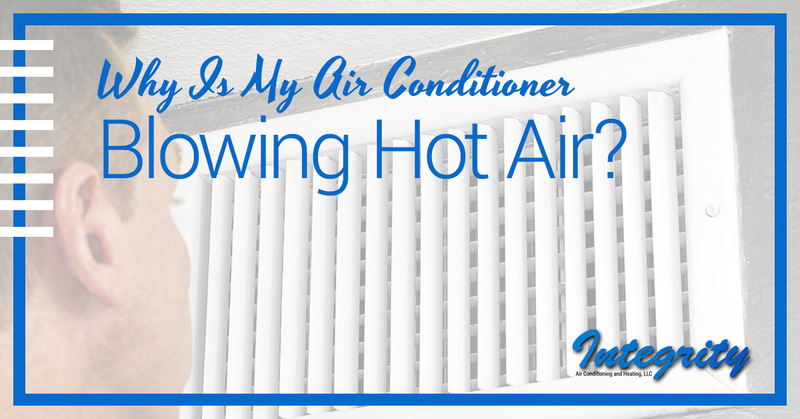 With that in mind, we’ve gathered some of the most common reasons why your air conditioner might be blowing hot air, along with some tips for how you can fix it. If you try these steps and it still isn’t working properly, call the HVAC professionals at Integrity AC and Heating. We’ll get it back up and running so you and your family can beat the heat. A thermostat has a fan setting that controls the fan within the air handler, inside your air conditioning unit. If you check the fan setting, you’ll see a few options. If the fan is set to “On”, that means it will continue to run, uninterrupted, even when air isn’t being cooled. That means it is continuing to cycle and pump out warm air. Switch the fan setting over to “Auto”. This will ensure that the fan only runs when you need cooling, so it will turn on automatically to circulate cooled air and turn off once the desired temperature has been reached. Refrigerant acts as a heat transfer liquid, which means it absorbs the heat from the air within your home. If you don’t have enough refrigerant, your air conditioner will struggle to cool the air. This is exacerbated on especially hot days. The only reason you would be low on refrigerant is if you have a leak, as it isn’t consumed like a gas. Frozen refrigerant line, which you’ll be able to tell just by looking at your outdoor unit. Air conditioner blows hot air during the day and cold air at night. You notice a hissing or bubbling noise coming from or near the air conditioner (symptom of a significant leak). Due to the dangerous nature of refrigerant, it is not recommended you attempt to fix this on your own. Instead, schedule an air conditioner repair with a professional (like Integrity AC and Heating). They will then find the leak, repair it, and add refrigerant to return it to operating levels. Air conditioners need clean air filters to run properly. If they haven’t been replaced or cleaned in a while, it will get clogged up with dirt, dust, and other nasty particles. Not only will this reduce your indoor air quality, it will also cause your AC unit to work harder to get through the filter. This extra effort will end up reducing your unit’s lifespan. When an air filter is dirty, return airflow will be blocked, which prevents your air conditioner from cooling the air properly. Check your filter at least once a month. Depending on your AC unit and the type of filter that you’re using, they will need to be replaced or cleaned anywhere from once every month to once every six months. Consult the manufacturer’s recommendations to see when you need to change or clean your filter. An outdoor air conditioning unit is designed to disperse heat from the refrigerant, which allows it to absorb more heat from within the house. If the outside unit gets too dirty, it is unable to properly disperse that heat, which means your AC will struggle to cool your home. This can be caused by accumulated dirt, leaves that have fallen on the unit, or encroaching foliage blocking the heat from being dispersed. At least once a year, it’s a good idea to spray your outdoor AC unit down with your garden hose on a softer setting. Whatever you do, do not go full power while spraying it down, as this can bend the condenser coil fins and severely hinder airflow. If those fins are bent, an HVAC professional will have to repair them for you. Another solution to consider is having a professional perform routine maintenance on your air conditioner to ensure it is properly cleaned and operating the way it should. It’s recommended you get air conditioner maintenance at least once a year. An air conditioning unit has two breakers; one for the outdoor unit and one for the indoor one. When the outdoor unit’s breaker is tripped, the indoor unit will continue to blow air, but it will not be cooled. That is because the outdoor unit is unable to properly disperse the heat when it is powered off. Take a peek at your fuse box to see if any breakers have been tripped. If one has, reset the breaker. If the breaker is tripped again, do not try resetting it again, as it can damage your air conditioner. Instead, contact an HVAC professional to inspect the issue. There are many other issues that can crop up and prevent your air conditioner from working properly. For instance, did you know that if you have your thermostat near appliances like a dryer, it can throw off its temperature readings and cause it to overwork itself? Placing your thermostat in a neutral area of your home will ensure it gets the most accurate reading possible. Keep an eye on this blog in the future for more helpful hints to get the most out of your air conditioner. To make sure your system is working properly, call Integrity AC and Heating. As Phoenix’s HVAC gurus, we’ll ensure your home is the comfy oasis that helps you escape the summer heat. Call us today!